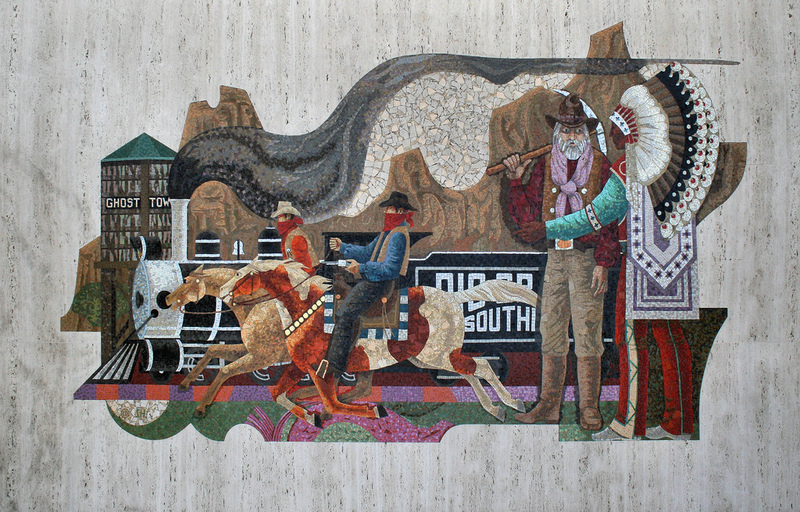 Millard Sheets (1907-1989) served as art director for the chain of Home Savings banks, and incorporated each community's history, landmarks and culture into the artwork. In Buena Park, you can see two former Home Savings buildings at the intersection of Beach Blvd and La Palma Ave. The building on the southeast corner was the first Buena Park Home Savings. When they outgrew that building, they built a new one on the northeast corner. 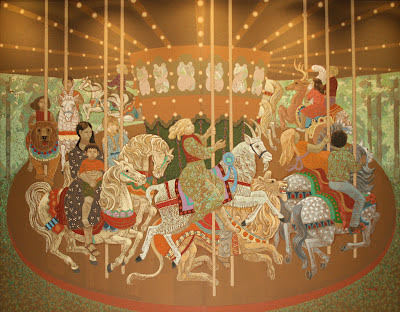 The image above is the Knott's Berry Farm themed mural from the front of the newer building. The painting below hangs inside the newer Buena Park building. 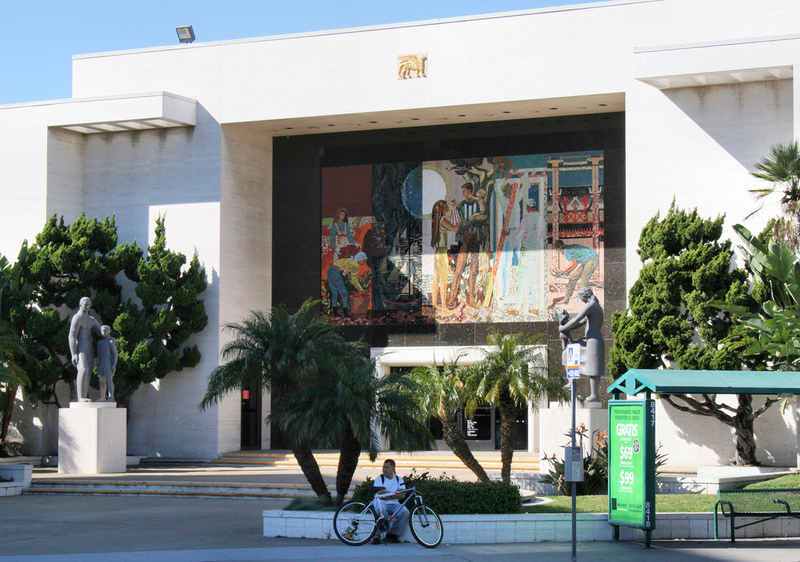 From 1952 until the beginning of the 1980s, Sheets, collaborating with artists like Denis O'Connor and Susan Hertel, designed the buildings and artwork for Home Savings branches all over California. The mural below is from the Downey branch. The painting above is by Hertel. Sheets studied art at Chouinard Art Institute (the source of so many of my favorite California artists) in Los Angeles. During the Great Depression, he helped lead the government's Public Works of Art Project in Southern California and painted murals inside the Department of the Interior building in Washington, D.C.The photo below shows a statue in front of the Santa Ana Home Savings. Note the echos of 1930s Regionalism. According to LAMurals.org, "During World War II [Sheets] traveled to India and Burma as a war artist for Life magazine. 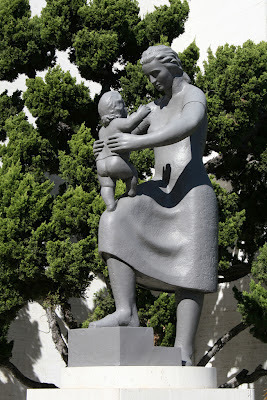 From the late 1930s until 1955 he headed the art departments at Scripps College and Claremont Graduate School. In 1953 he became director of Otis Art Institute (now Otis/Parsons), and while in that position created a new official seal for the County of Los Angeles... Outside of California his major commissions included murals for the Detroit Public Library, the Mayo Clinic, the dome of the National Shrine in Washington, D.C., the Notre Dame University Library, and the Hilton Hotel in Honolulu." I used to enjoy visiting the art gallery of Millard's son, David Stary-Sheets, which was located at first in Old Town Irvine and later in Laguna Beach. He specialized in furniture and in paintings by the California Regionalists, including his father. Sadly, David died in 2000, and there hasn't been anything quite like the Stary-Sheets Gallery since then. Anyway, this Home Savings exhibit is long overdue. If you're not a fan of these buildings and their art, I'd be a little worried about you. Thanks for the great information. I plan to go see it. Olinda, Ray Rast, Veta Schlimgen, Laguna, etc. New local history books from all over O.C.